Make naptime even better with the Frisco Ultra-Plush Pillow Pet Bed Mat. Whether they meow or bark, your four-legged family members will find the ultra-plush fabric irresistible for settling in for an all-day snooze. 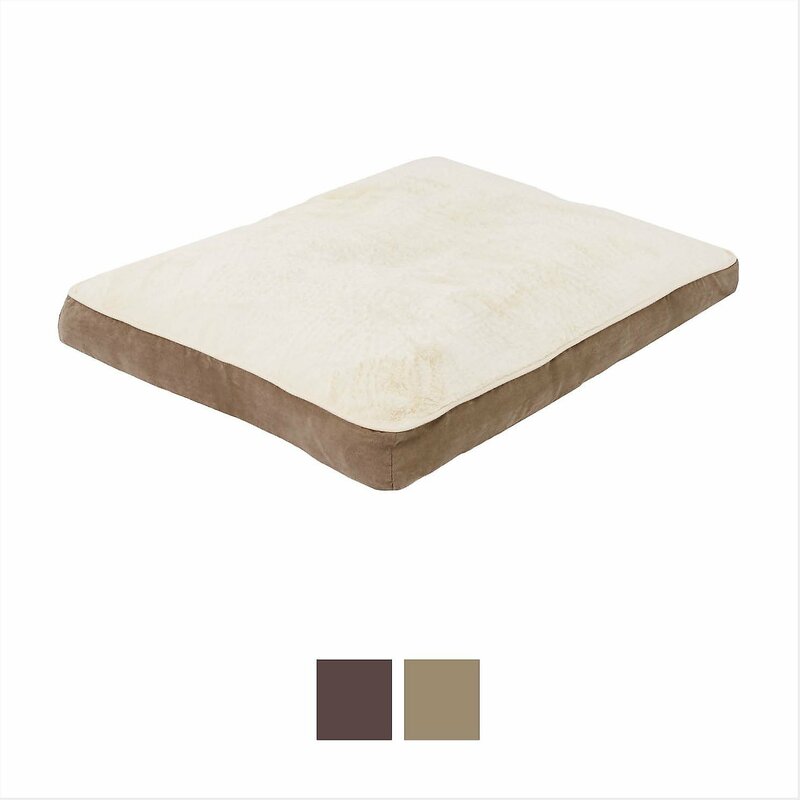 It’s stuffed with fluffy polyester fiber filling for extra cushioning and comfort, and the step-on design makes it easier for small pets and seniors to get in and out of the bed. The outer edge is covered in soft faux suede in a neutral color, so it fits right in with the décor no matter which room it’s in. This comfy bed is machine washable with a removable cover for easy cleaning and care, and it comes in multiple sizes to fit every pet and sleeping style. Cozy pet bed with a soft, ultra-plush fabric that covers the sleeping area—it’s the perfect spot for an all-day nap. Outer edge is covered in faux suede fabric that’s soft to the touch in a solid, neutral brown color that goes with any home décor. Step-on design makes the bed more accessible for small pets and senior dogs and cats that might have trouble stepping into a bed with raised sides. 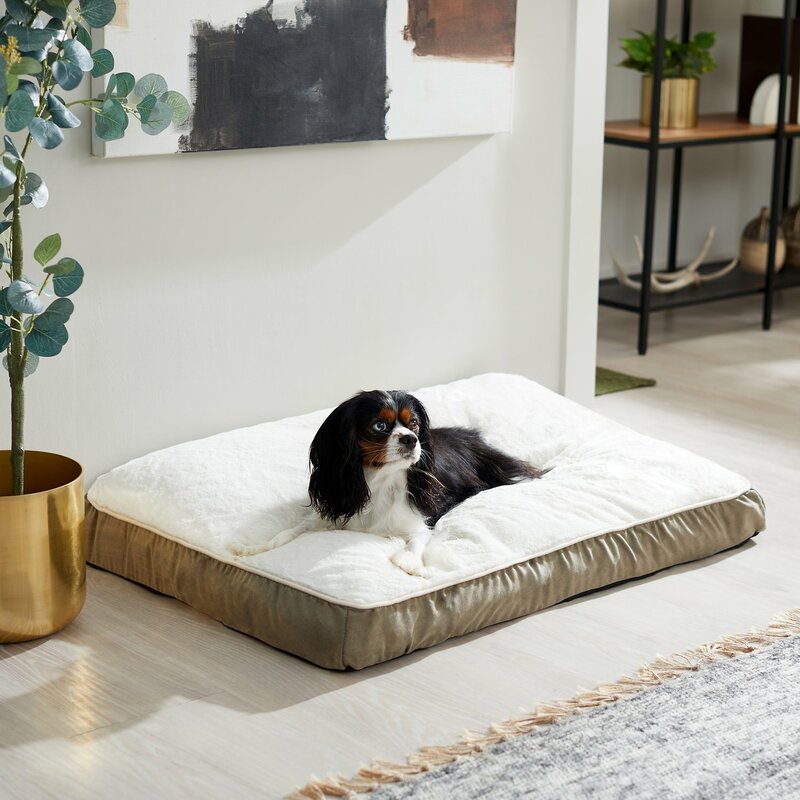 This bed is stuffed with a fluffy polyester fiber filling that gives it plenty of cushioning for pets to get extra comfortable, no matter their sleeping style. Available in multiple sizes to fit small dogs, puppies and kittens all the way up to larger breeds. Machine washable with removable cover for easy cleaning. I have two labs both weigh around 80lbs or so. I bought each of them one of these dog beds hoping it would help transition them off our bed at night. As much as my husband and I love night time cuddles with my dogs it’s proving to be quite difficult as I am pregnant and need some extra room to sleep! These beds have been great and they are loving their own space and a comfy place to lay. The fabric is nice and soft and the amount of filling is great, hoping it doesn’t breakdown too soon but for the price I can’t complain. As always delivery was fast and it really is a good quality bed. Would highly recommend. Adding some luxury comfort to the pup’s lodging. Large size fits very close to dimensions of his crate. Outer cover is removable(hook & loop opening), which permits laundering in case of an accident. Cushion itself is medium in ridgidness (vs too spongy or high dense support.) Owned it for several weeks, laundered on gentile cycle and came out looking box new. Worth consideration on list of cushion selections for your dog. Too thick and unstable. Not one of my three cats will stay on it let alone use it. I had taken the cover off to put the pillow and the case in the sun for several hours and it turns out it looks like a cheap human pillow with a fancy cover. That’s all. Too thick in middle! Photo attached for old one they liked and new nit-good one. Don’t waste your money! Our yellow lab is crated throughout the day, he loves the safety of the enclosed space, but chewed a hole in everything I bought so far: blankets, towels, even the Kong Brand beds! At $50-65 a piece, it was draining my wallet! I finally realized what he wanted was more padding, and when I found this the reviews sold me on it. He hasn’t even chewed the tag, he loves this bed and chooses to be on it even when we’re home and the kennel is open. This is a winner, will definitely repurchase when it wears out. When we received this bed, it was much fluffier than expected. I thought from the photo that it was a fairly level style bed, but upon receiving it, I realized that it is kind of a mound shape. I expect it may flatten out a bit after our dog lays on it, but for now he's not really sure what to do. I do really love that the zipper is on the bottom and has a flap covering it. Previous beds have had the zipper on the end, and our dog chewed the zipper up. Dog loves it, washer doesn’t. My Dog loved the bed. I figured the bed wouldn’t be difficult to wash, it’s not rocket since. Washing the outter layer wasn’t an issue. Now when it comes to the actual inner bedding, terrible. First wash and it tore up inside the washer... the material seemed very thin like paper so made sense as to why it ripped. This bed isn’t as durable so be careful when you wash it. My pup loves this bed. He loves it so much, he prefers this over a much more expensive bed I bought for him. I've laid on it before out of curiosity and find it very comfortable as well. You can fluff it like a pillow and it's like brand new. A friend ordered this bed for my latest rescue: a severely emaciated, former bait dog, that had never been inside a home, let alone had a bed to herself. She immediately fell in love with this bed and I always know where to find her! The bed is large enough for her to spread out and super soft! Thankfully she's not a chewer (I don't think the fabric would hold up) so this was the perfect thing to make her feel at home and give her a soft place to rest comfortably, regardless of her emaciated state! My dog used to chew all her crate beds so I thought I would give this a try now that she is older. Almost 4 weeks now and still plush ( about 4+ inch of cushion) Ps if photo doesn't load sorry I tried several times. U can wash outer cover.